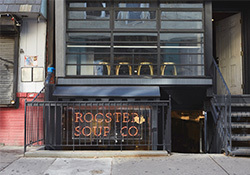 Rooster Soup Co is a luncheonette-style collaboration restauranty between Federal Donuts and the Broad Street Ministry. The restaurant donates 100% of its daily net profits to the Broad Street’s Hospitality Collaborative. The Hospitality Collaborative’s mission is to feed, clothe and support those in need such as the homeless community in Philadelphia. Tweets from Rooster Soup Co.